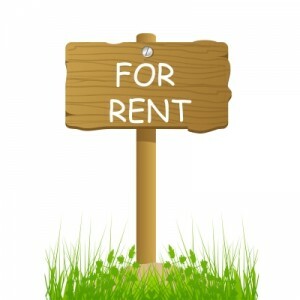 A few weeks ago we received the alarming news that our leasing office is raising our rent from $1005 to $1065 per month. Five years ago, when Kyle first moved in, the rent was closer to $900 per month and last year, the increase was only $5 per month, so overall they have been moderate until this year. While we are extremely happy with our apartment and will attempt to negotiate this increase, we decided it was time to take a look around Durham and see what is available and at what price ranges. As we have worked and worked our budget to wring all the extra money out of it that we’re willing to, it seems that we really have to attack our fixed expenses, and chief among those is rent. Because of our years of experience living in Durham, it was easy to narrow down to a few geographic areas to consider based on our commute time to work and church and the types of housing available in the neighborhoods surrounding our school. One thing we love about our current apartment is its proximity to a certain highway, so we are only looking at places off a couple nearby exits from that highway. Another quick way to narrow is by number of bedrooms, but we’re actually waffling on that. Surprisingly, there is a lot of overlap in the price ranges of these places – a 1-bedroom apartment in our current complex is about as expensive as a 2- or 3-bedroom townhouse in many other neighborhoods. I’m not sure why, but it seems overall that townhouses, even those available within complexes, are much less expensive than apartments. Two bedrooms (almost 1200 sq. ft.) has been a nice amount of space for us these last two years, but we could probably downsize without too much strain on our marriage. The other consideration for the number of bedrooms and bathrooms is our uncertainty about where Kyle will be living next year. If he leaves the area, I’ll have the choice of taking a roommate if we are living in a 2- or 3-bedroom, living by myself if we are living in a 1-bedroom, or moving. Even though Kyle will be making more money in this scenario, we’ll have the additional travel costs of trying to see one another as frequently as possible so it would still be prudent to both have roommates to keep our living costs down. So downsizing to a 1-bedroom would be OK, if perhaps a bit tight, for one year until Kyle (possibly) leaves, but then I would probably need to move again. Getting a 2- or 3-bedroom now, as long as it’s affordable, would save us the possible cost of moving again in a year and I could easily take a roommate whenever Kyle moves. 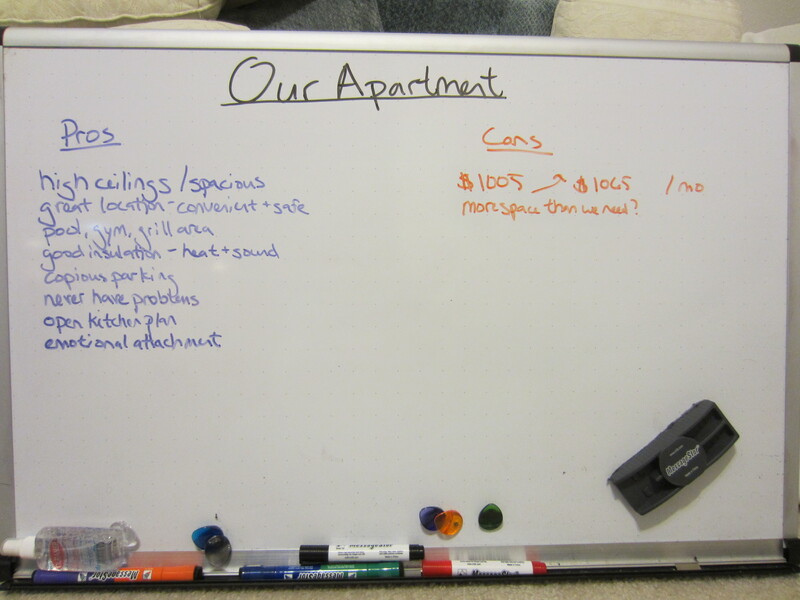 I made a list of all the aspects of our apartment that we love. We have viewed two townhouses and are making an appointment to view another this week (same layout in two locations). Here are the side-by-side comparisons of our current apartment, my last apartment, and the four other properties on our radar right now. We also might gain another half-bath in certain townhouses and possibly some square footage. It looks like safety isn’t going to be an issue according to the Durham crime map no matter where we move (we have basically eliminated SS as a possibility) so that is reassuring. We consider where we live now to be very safe. I’m happy with this table as it shows us more clearly exactly what we’re trading for the extra $150-200 in rent. Just from what I have listed, I don’t think those aspects are worth the money, but there are two more intangibles – the stress of moving and the emotional attachment we have to our current apartment. The stress of moving is easy to understand, and there would be some cost associated, but I think moving itself would be manageable within a few days. 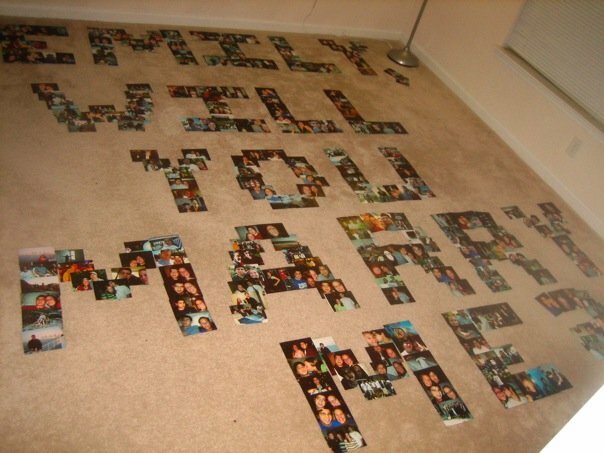 the major part of Kyle’s proposal, photos of us – you can’t see the question mark point but it was awesome. As for the emotional attachment, this apartment is where we started our married life together. Kyle proposed to me in the room that is now our bedroom, and we spent our wedding night there as well. I hadn’t planned on walking away from the physical reminders of those events before we needed to leave the city entirely. Kyle is going to try to negotiate our rent this week. Right now it’s slated to be only $30/month below the list price, which is insulting. When he first moved here he was about $150 below the list price and I would think saving them 5 years worth of turnover costs would be worth something! What attributes of your living space are important to you? Do you consider different properties quantitatively or qualitatively? How much weight do you put on staying in a home that holds special memories? 22 Responses to "Searching for a New Home"
Moving usually a tough choice, so many different variations on a theme. I recently had to move from LA to FL, and I was only able to pack 12 boxes. One thing about moving, it’s very liberating, getting rid of “unnecessary” stuff. From the looks of it, you have a plan and are sticking to it. From experience, I can say memories made in a house are difficult to leave behind, but new memories will be made in a new place. I am looking forward to culling our stuff a bit. I like to think of myself as not owning much but I’m afraid 2 years in the same place along with tons of wedding gifts has shifted our reality. I may embark on that even if we don’t end up moving. My plan was to leave Durham with the same amount of stuff I had coming in – only what could fit in my tiny car – but now we have a nice bed and appliances and such so we’ll probably have to rent a U-haul. It’s hard leaving a place where memories have been established. After leaving my condo of eight years, it honestly took me 2-3 years of living in my current residence before I thought of it as ‘home’. Just found your blog (through Erika at From Shopping to Saving, I believe) and was excited to find a PF blogger from Durham, where I live! I rented for a few years, and my husband and I recently purchased our first home in southwest Durham. We went through a similar situation as you are while we were renting. I had luck writing the management of our apartment complex a letter; I explained that if we moved out and the apartment stood vacant for even 2 weeks they’d loose the amount of money that they wanted to increase our rent by. We ended up meeting in the middle for an increase that was fine for us. Cool! We live in SW Durham too! I love the area. We’re only looking to move within a couple exits on 15/501 because we love our current location so much. Now that I’ve seen how much cheaper some other properties are I’d have a hard time even with a zero increase on our rent. 🙁 A letter or at least some done-in-advance calculations is a good idea. I wonder why they’ve raised the price on you. Like you said, they’re saving money on turnover costs. Jeff and I had a townhouse before we bought our current house and we couldn’t believe how cheap it was either! It was 2 stories, and had a finished basement, so it was a lot more space than we had when I stayed over at his 1-bedroom apartment. I’m so glad we bought that townhouse, because we made a bit of money on the resale. Have you thought about buying a place? Michelle recently posted..Are Your Friends Smart With Money? The number of bedrooms issue is also complicated by the question of just what exactly is a bedroom. When we were looking, we knew we needed 2 bedrooms, or 1 bedroom with a den/office/study, or 1 bedroom with a very large living room. Yes, very good point. Right now our second bedroom is Kyle’s office. We could definitely get by with a 1 BR with an additional nook or loft or similar for his desk. Wow, rent is high where you are! I’m all about space, but that’s expensive! When we bought our house, the selling point for me was a bonus room for the kids/home office for me. Really, you consider this high rent? We moved here from the DC area and L.A. so we were happy for the break! It has crept up over the years – my first apartment in Durham was $800 for a 2BR/2BA, which I thought was quite reasonable. 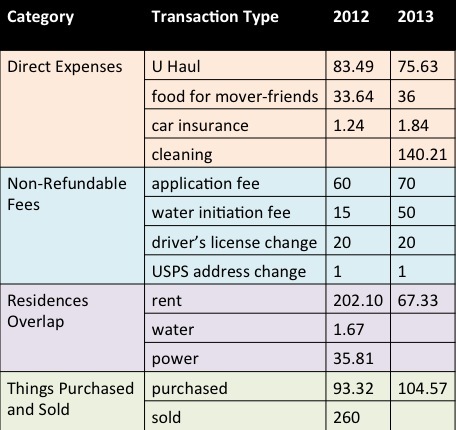 There are lots of cheaper places and some more expensive places than where we live now. Holy moly was his proposal so cute/sweet!!! Our rent went up $25 this year. Gag. It’s always a hard decision…factoring in the costs of having money for a security deposit/first months/last months rent, plus the cost of renting a truck and recruiting friends to help or paying a moving service….it makes it a real pain. But if you stay somewhere long term there are real financial benefits. I’d say, depending on parking, T1 is looking pretty good. Thanks – I was blown away by Kyle’s proposal. 🙂 It’s still the best proposal story of anyone I know IRL – well, maybe tied with my friend who got engaged last month. Yes, I think it will take a few months to make up for the costs of paying two rents simultaneously plus the costs of moving but staying for 2 years will make it worth it. Unfortunately T1 and T2 have insanely long waiting lists, I’ve learned… So we may give our 60 days notice and jump at whatever is available when we need to sign a new lease. Rent is so cheap where you are! Something similar to your apartment would probably run about $1,800 – $2,600 where I am. And my 2 bedroom/2 bathroom condo is going to run me about $1,730 per month, which seems like a great deal to me. Rent has regularly been going up about 10% around here, which is insane. I like a lot of space, with walls and doors between rooms. I like large showers, not the small box ones. I also like a good amount of kitchen cupboard space. My condo even has a pantry! I also like my closet space in the bedroom and outside of it. I also really like everything being on one floor, which reduces my house options, but works fine for a condo… I’ve never lived in a place with special memories, so I can’t comment on that. I’m thankfully not going to have to move for awhile again once I move to the condo! I have been moving apartments every year since starting college. I’m used to it? But I hate packing and unpacking. We signed an 18 month lease on the apartment, and I think we might do another one after this on is up. I’ve done two-year stints at max in apartments it’s very nice to not have to move! I wish we didn’t feel forced into this move because it’s a pain.